Let them shake and boogie to their heart's content with our Dancing Ribbons. These brightly coloured accessories are a brilliant way to encourage shy and timid children to get involved in a group activity. Each one features a strong woven nylon hand strap for durability with 6 strands of 1-meter long ribbon. 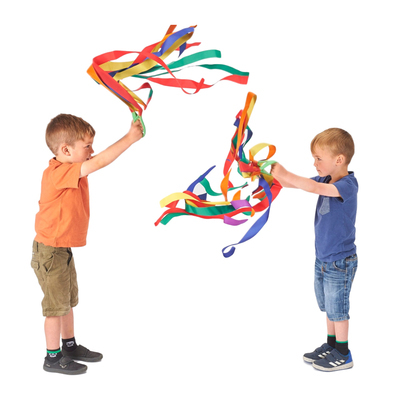 Encourage them to shake, sway and swoosh the ribbons as they see fit - these dancing ribbons are a brilliant tool for developing a range of different physical skills. They are suitable for all ages - from babies through to teenagers and can also be used for unstructured play. Why not consider adding our Wrist Bells with Velcro Straps to your basket today and let them shake up a storm?